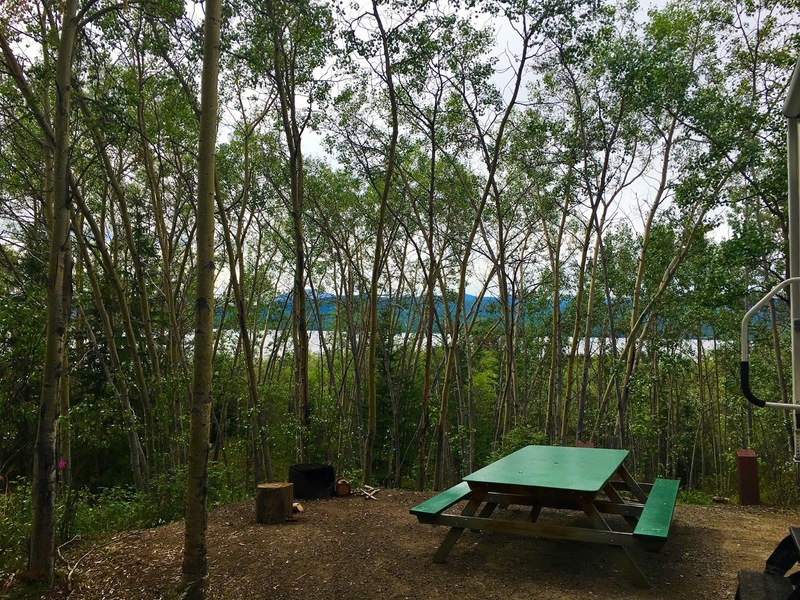 A short driving day today to Teslin Lake Government Campground. 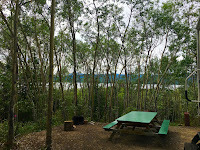 I think that in Canada a government campground is the same thing as a provincial campground since the Yukon is a territory instead of a province. We have a site with a limited view of Teslin Lake out the back window of the trailer. I've never camped here but I did camp at the now closed salmon bake restaurant next door often. If you were a restaurant customer, camping was free. They even took their customers out on the lake on a large pontoon boat. We spent a bit of time at the heritage center where there were nice displays of wooden masks and beadwork. There was supposed to be a boathouse with some hand carved canoes. These weren't them as they were made of fiberglass. I think that they were part of a huge celebration the previous weekend. There were quite a few people straightening out the grounds and hauling away rented equipment. I think the boat house was locked as the staff was busy with the cleanup. I believe that each of these carved poles represented a different group. At least that was our assumption based on some banners flying from the building. Not a lot of description. The Heritage Center was well worth the $5 admission. We ran the microwave off of the inverter again. While running in defrost mode, it alternates between 100 amps and 5 amps DC draw off of the battery bank. I would think that the cycling may be a problem when running on a generator but I guess people do it all the time. I'm really liking the 12 volt setup. Currently, the microwave is on a separate 15 amp circuit in the fuse panel. So if I want to run it off the inverter, I need to use an extension cord. There is, obviously, no Internet at the Teslin campground. I think we will be at an RV park in Whitehorse for a couple of days. Some time to rest from the constant travel. So this will be posted a day late. Glad you are taking the scenic route and sharing it ... I've never been there. The Internet was really slow no matter where we are in the Yukon. So pictures really take a long time to upload. Somehow got here after day 89, lol. The heritage center sounds very interesting!